We offer Productivity improvements for our Blade program with PVD Ceramic edge coatings. Most noteworthy is our standard Gold-TiN will extend blades life by 4/5 times. While our Boron Carbide Ceramic coating will last 10 times non coated blades, excellent for abrasive films. If your substrate is sticky or gummy, causing a buildup on cutting edge, we offer a 100% Teflon coated razor. Finally for optimum Blade performance, we offer solid Tungsten Carbide and Zirconia Ceramic blade materials that will perform 60/80% longer than non-coated Razors. 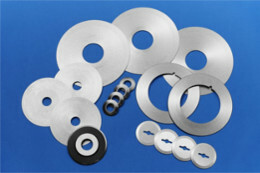 Our solid Carbide blades are produced ultra sub micron grain Tungsten Carbide. Extremely wear resistant with hardness of RC 80. Ideal for white films and re-sharpenable for 3/4 additional runs. Zirconia Ceramic razors are produced from sub micron grain Ceramic and Hot Isostatic pressed for smooth cutting edge with lowest coefficient of friction during slitting. More brittle than Carbide, but in many cases able to run even longer. Please review our Cutting Solutions tab above, as our Productivity improvements above can often be applied to our many other cutting blades offered, circular score, and shear slitter blades. We understand your Slitting & Slicing blades are vital to keeping your business operating smoothly. Our goal is to make your job easier, finding the quality blades you need, saving you time and reducing your company’s costs.